The in vivo glucose lowering effect of orally administered inorganic vanadium compounds in diabetes was first reported in our laboratory in 1985. 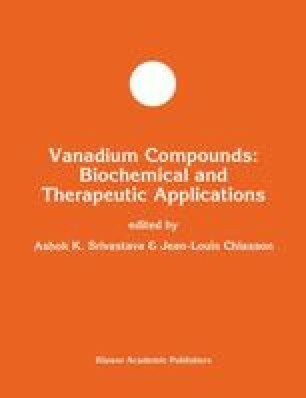 While both vanadate and vanadyl forms of vanadium are orally active, they are still not well absorbed. We have synthesized several organic vanadium compounds and one compound, bis(maltolato)oxovanadium(IV) or BMOV, has been extensively investigated. BMOV proved effective in lowering plasma glucose and lipids in STZ-diabetic rats when administered in drinking water over a 25 week period. The maintenance dose (0.18 mmol/kg/day) was approximately 50% of that required for vanadyl sulfate (VS). Secondary complications of diabetes were prevented by BMOV and no marked toxicity was noted. Oral gavage of STZ-diabetic rats with BMOV also reduced blood glucose levels. The ED50 for BMOV was 0.5 mmol/kg, while for VS the estimated ED50 was 0.9 mmol/kg. BMOV was also effective by the intraperitoneal route in STZ-diabetic rats. The ED50 was 0.08 mmol/kg compared to 0.22 mmol/kg for VS. Some animals treated p.o. or i.p. remained euglycemic for up to 14 weeks. An i.v. infusion of BMOV of 0.05 mmol/kg over a 30 min period reduced plasma glucose levels by 50% while VS was not effective.